MANILA, Philippines - Kapamilya star Kim Chiu trended anew on social media on Thursday morning, November 12 not for the 'AlDub gown issue' but on the alleged VIP treatment she received during the Commission on Election (COMELEC) satellite registration for the 2016 polls in one mall in Marikina City last October 27, 2015. 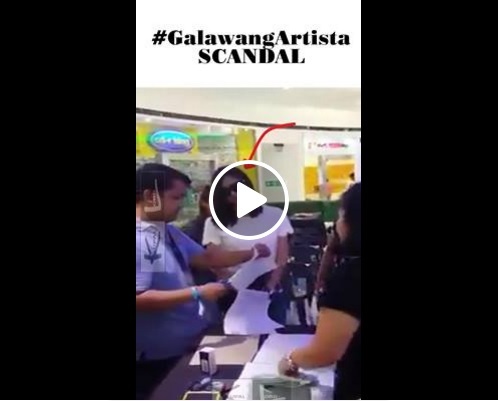 The Facebook post of 'Kupal Lord' page with '#GalawangArtista Scandal' video title went viral in just few hours after the page published the story. The post already garnered more than 20,000 Likes and 16,000 plus shares on the social networking site as of press time. The video which echoed "KAPAG ARTISTA, PWEDE NA LAHAT!" came from a certain Fred L. on Facebook. The complainant claimed that Kim Chiu came when the processing of registration has started. He was pissed off as the COMELEC officials accommodated her quickly instead of falling in the line. "Priority, eto yung priority nila! Ms., bakit nauna pa 'tong mga ito. Di naman nakapila yan. Eto yung mga di pumila, lalabas natin 'to sa Facebook," the complainant said. "Artista yan eh," COMELEC officer answered. The complainant added: "Kaya nga, wala akong pakialam kung sino siya. Diba? Kaya pala nauna pa mga pictyuran." He also insisted COMELEC's given schedule for the voters registration is from 8AM-9pm and they prioritized celebrity instead of them who waited to get registered. The officer claimed the actual registration to start at 11am. "Ang ganda ng sistema ninyo talaga. Tapos inuna ninyo pa yung artista na di pumila. Diba? Ewan ko ba, si Kim Chiu daw yan, ewan ko kung sino," he argued. Majority of netizens who commented on the video bashed the actress. A netizen asked the Chinita Princess on Twitter of her reaction on the viral video. The actress explained she's already at the mall early in the morning with Chiu's representative lined up on her behalf. @adel_delica i was there 7:30am po kasi i had a flight after, my RM lined up for me po,close pa mall. 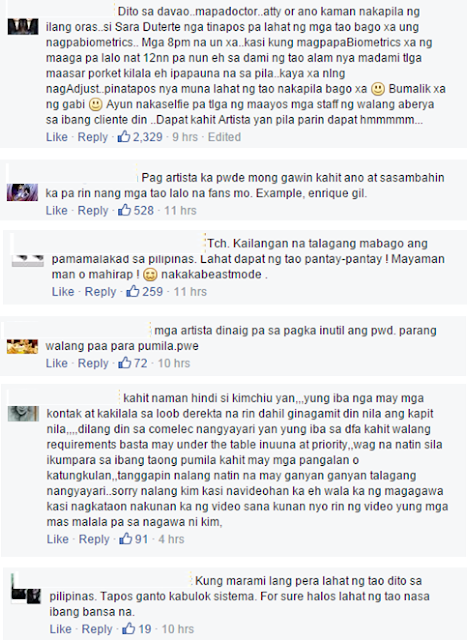 nung turn ko na po tsaka ako bumaba..
Chiu also advised netizens to get the whole story first before judging. On October 27, Kim Chiu posted on her Instagram account a photo of her successful registration at COMELEC. "early morning registration every vote counts! registration open until oct31 #election2016 thanks ate @maquieraquiza for helping me today!," it captioned. 'WeSupport KimChiu' has trended on Twitter just few hours after the video became viral online. Followers and those who believed on the Kapamilya star defended her against social media attacks.